Today's Tasty Friday Tutorial is one of those answers to the question, "How do they do that?" We answer the question, "How do you make spun sugar?" The answer is from the book The Sweet Book of Candy Making: From the Simple to the Spectacular-How to Make Caramels, Fudge, Hard Candy, Fondant, Toffee, and More!. Spun sugar, so pretty and seems to defy logic. Giveaway ends March 31, 2014. The Sweet Book of Candy Making: From the Simple to the Spectacular-How to Make Caramels, Fudge, Hard Candy, Fondant, Toffee, and More! Create your own delicious, gorgeous, and professional-quality candies with The Sweet Book of Candy Making. Whether you're a beginner or a seasoned candy maker, you will find mouthwatering recipes and expert tips to inspire you—and satisfy your sweet tooth. 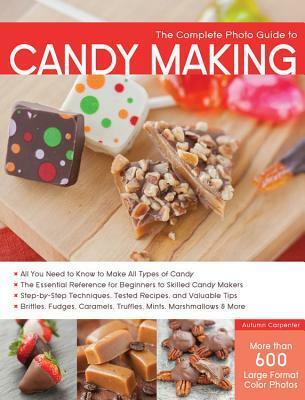 Get started in your kitchen with The Sweet Book of Candy Making! Elizabeth LaBau is a food writer and confectioner based in Los Angeles, California. She applies her years of experience as a professional pastry chef to bringing a modern touch to the world of old-fashioned candy making. Since 2006, she has been the Guide to Candy at About.com, an online division of the New York Times Company. At http://candy.about.com, she provides fun, creative candy recipes and step-by-step tutorials for the home cook. When she's not playing with sugar in the kitchen, she can be found running the trails around Los Angeles with a piece of candy tucked into her pocket. Visit her online at http://www.elizabethlabau.com, http://www.sugarhero.com, and http://www.runningwithsugars.com.